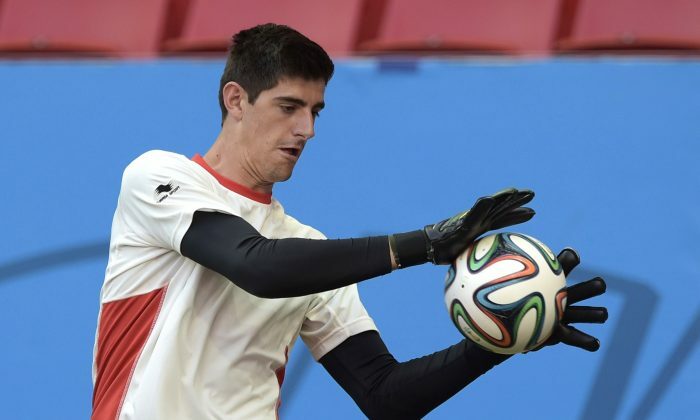 Chelsea goalkeeper Thibaut Courtois could have moved to Barcelona. According to Mundo Deportivo, Andoni Zubizarreta, Barcelona’s director of football, contacted Chelsea over the possibility of taking Courtois on loan after his stint at Atletico Madrid was completed. Chelsea rejected that and an offer for their current no. 1 goalie Petr Cech. The 22-year-old Belgium international has played well at the World Cup so far, keeping two clean sheets in 4 matches, and letting in only 2 goals. MOGI DAS CRUZES, Brazil (AP) — This is as close to ‘rent-a-crowd’ that the World Cup will come. And it won’t cost Belgium anything. Expected to be outnumbered by tens of thousands of Argentina fans at Saturday’s quarterfinal at the 70,000-capacity Estadio Nacional in Brasilia, Belgium coach Marc Wilmots gently stoked a regional rivalry to suit his ends. “The Brazilians expect only one thing and that is that we beat the Argentinians,” Wilmots said on Thursday, referring to a long and sometimes bitter rivalry between the neighboring football giants. And after ploughing head-first into the fiery debate, he quickly added: “But I am not getting into that issue.” Brazil’s rivalry with Argentina goes beyond sports, with each side boasting about their country at every opportunity. Belgian fans traveled in their thousands to group games, adding patches of bright red in the grandstands. But since planning for the knockout stages is fraught with uncertainty, far fewer were at the second round game against the United States in Salvador, and fewer still are expected on Saturday. “We are proud to see our colors in the stadium. But if they are 2 or 2000, it is not a problem. We are used to hostile environments,” Wilmots said. “The more Belgian backers the merrier, but we will also get a lot of Brazilian backing,” he said. Players have already received a boost by seeing the wild scenes of support back home, where the backing for the Red Devils is unprecedented. In its group stage matches, Argentina felt like it was playing at home, with tens of thousands of traveling Argentines wearing the team’s colors — painting the stands in light-blue and white. But in the round of 16 match against Switzerland in Sao Paulo, the Argentines found themselves outnumbered, and at times drowned out by Brazilian fans who can’t stay neutral when their Latin American rival is playing. The Brazilians booed and whistled when Argentina had the ball and shouted “Ole” when the Swiss strung a few passes together. As the Argentina fans joined together for a popular song in which they vow to own Brazil’s World Cup, the Brazilian crowd responded by chant “Pentacampeao,” or five-time champion, reminding their neighbors of who has the most World Cup titles. Argentina has two. In football, the rivalry gets heated the most, with an ongoing debate about which country is the real South American powerhouse. The conversation always goes back to whether Pele or Diego Maradona is the best player of all time, and it continues with discussions about Neymar and Lionel Messi now. Within Brazil, Argentina is seen as the main challenger for the final at the Maracana stadium on July 13, and just about every home fan would like to see the neighbors eliminated earlier. Losing to Argentina in a final at the Maracana would be almost unthinkable to Brazilian fans.